Tied at halftime, Platte County and Smithville had battled to a stalemate in a hard-fought half. 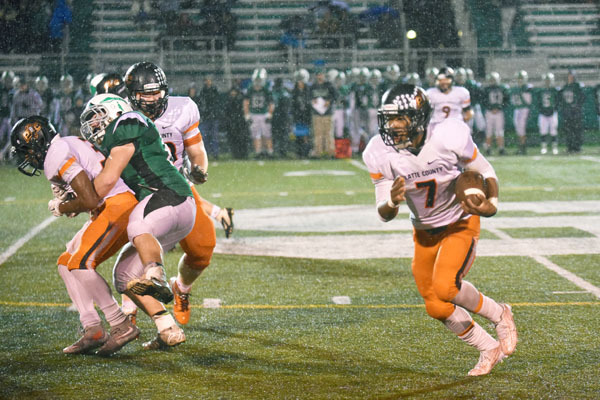 The second half was a different story on a rainy night at Smithville High School. The Pirates capitalized on four second-half turnover by the Warriors to win 23-7. The opportunistic Pirates turned those four turnovers into 16 points over the final two quarters led by a stingy defense, tough offensive line and backfield tandem of quarterback Lloyd Lockett and running back Mike McNair. McNair finished with three touchdowns and a 109 yards on 24 carries. Lockett carried 21 times for 109 yards and the Pirates defense held Smithville under 200 yards of total offense. In fact, Smithville only ventured into Pirates’ territory twice all night. Their lone touchdown coming on a 10-yard run from Tanner Hartman in the first quarter after a long completion from quarterback Mitchell Orr to receiver JD Benbow. Platte County grabbed the lead for good with 4 minutes, 6 seconds left in the third. After recovering a fumble on the Smithville 30-yard line the big play came on fourth down and one. Lockett kept the ball, darted to his left, broke a tackle and darted down the sideline to the Smithville 1-yard line. Two plays later, McNair crashed in from a yard out to make the score 14-7. While Smithville fumbled four times, the Pirates managed only an interception and a fumble — in the first half on a quarterback-center exchange — and no turnovers in the second half. McNair said ball protection is always a priority, regardless of the weather. Down 17-7, Smithville looked like they were going to cut into Platte County’s lead. The Warriors took advantage of two personal fouls and two passes from Orr to move the ball to the Pirates’ 7-yard line. However, the Pirates defense bowed its neck, defending two passes in the end zone. A 24-yard field goal try never happened after Orr couldn’t handle the high snap, and the Pirates recovered at their own 22-yard line. McNair put the game away with his third touchdown of the night, taking advantage of the Warriors final turnover. This one came on a punt catch Smithville muffed at its own 31-yard line. Five plays later, McNair found paydirt from 15 yards away, and the Pirates celebrated their impending trip to the Class 4 District 8 finals. The Pirates also exercised some demons with the victory. The Warriors have ended their season the last two years.